Everything is in your control when you realize that nothing’s in your control. Let’s try and accept a simple truth that we can never be in control of what happens to us or of what people around us do. Much of our frustration with Life comes from trying to control everything and everyone around us. What we have control over is how we respond to situations and not really in the way the situations themselves occur! When we live our lives as if we are just witnesses, observers, we will be perpetually happy. So beautiful, isn’t it? Another’s thoughts and actions are not in your control. 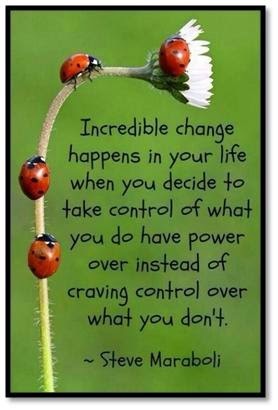 What happens to you in Life is not in your control. When you awaken to this reality, you discover that you are in control ONLY of yourself! From that clarity, bliss is born! Then everything that matters fills your Life__love, peace, good health and joy! 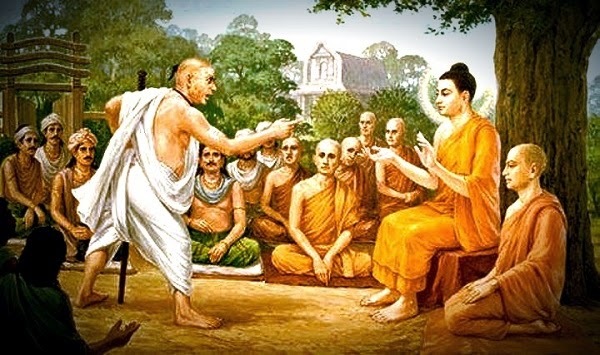 Author AVIS ViswanathanPosted on July 4, 2015 March 14, 2016 Categories Ananda, Art of Living, Buddha, Control, http://schemas.google.com/blogger/2008/kind#post, Inner Peace, Intelligent Living, OshoLeave a comment on Everything is in your control when you realize that nothing’s in your control. When your Life’s design begins to go against what you have planned, recognize that it is yet another affirmation that you are not in control. Someone wrote to me a while ago saying his failing business was causing him much grief. He said he was consumed by worry and fear. He wondered if his business would ever be back in his control? I am not sure I can say how things may work out for my friend. But a simpler way to deal with Life will be to stop believing or imagining that you are, or were, ever in control of anything!! We humans make a virtue of our ill-founded belief that we are in control. You want your mind, your body, your spouse, your children, your employees, your neighbors and your government to work according to your whims and aspirations. Nothing wrong with the want per se. Except that it will not be fulfilled! Your mind cannot be in your control unless you anchor in silence (the practice of ‘mouna’) for at least an hour daily. Your body cannot be in your control unless you have your mind trained to being still. 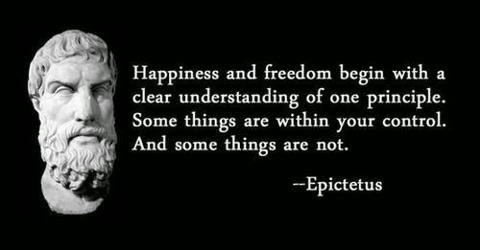 People, and governments, will continue to do what they want despite what you think or expect of them. Still we kid ourselves into believing that we are in control? Someone does something rude, nasty, harsh to you, like a colleague quits in a huff leaving you and your project stranded, you begin to wonder how-dare-he? This thinking spurs another thought that you must avenge this act. That leads to yet another thought that makes you plot and want to wish the worst for your detractor. So much negativity. So much grief. Step back and ask yourself, is this all worth it? What do you, or I, control? You can’t even control your heart beat. It beats so you are alive. Can you control its stopping to beat? And what if it chooses to? Can you do anything about it? Fundamentally, you are a freak if you think you control Life. This doesn’t mean you and I should feel diffident about Life and resign ourselves to a master controller’s actions. Instead learn to act in the given moment with the circumstances that have been delivered unto you. Accept what is, do what you think you can best do in the situation with peace and joy, and just do it. Then deal with the next moment similarly. And so on. If each time, the thread is pulled away from your hand and cast on the floor, pick it up again and wind it up, slowly, peacefully. Be patient. Be accepting. Believe. Be. When you live Life this way, Life may not exactly be what you may want it to be, but your ability to be in bliss will be sufficiently enhanced and enabled! Life really is so simple. It is a whole of two parts: one that is beyond your control and the other that is within your control. This is the truth of Life. Intelligent Living is about knowing this truth and practicing it, knowing what is beyond and what is within your control. When you try to control what is uncontrollable or when you don’t act on things that are within your control, in both these instances, you experience suffering. Soak in this simple philosophy. 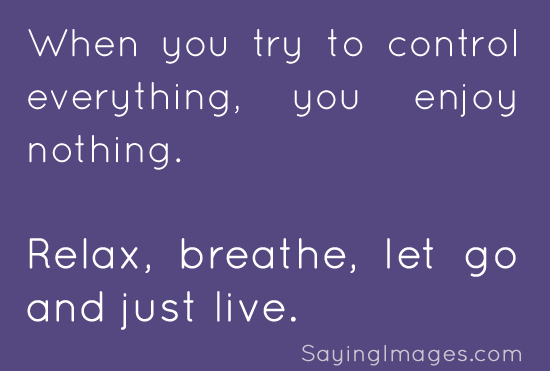 Don’t try to control Life. But you can choose to respond by living intelligently though__accepting whatever happens, calmly, dispassionately! The paradoxes of Life simplify it, as long as you can see them and accept them! The problem with education is that it makes us argue and reason with everything that comes our way. While it is good in most respects, in the matter of dealing with Life, we must realize that its simple realities are non-negotiable. Because we don’t realize this, we refuse to accept a simple, irrefutable truth that when we give up control__of people, things and events__they just come back to us. We try to control because we think we are in control. Wrong. We are just witnesses, observers. What we have control over is how we respond__not react__to situations and not really in the way the situations themselves occur! So beautiful, isn’t it? Another’s thoughts and actions are not in your control. What happens to youin Life is not in your control. When you awaken to this reality, you discover that you are in control onlyof yourself, only of how you respond! From that clarity, bliss is born! Then everything that matters fills your Life__love, peace, good health and joy! Cultivate patience – especially in situations where you have no control over what’s going on! Two evenings ago, I was riding in an auto-rickshaw through rush hour traffic. We got stuck in a massive traffic jam that last over 30 minutes. The heat and humidity was maddening. People were impatient in their vehicles and kept honking in vain, adding to the chaos. Not a vehicle budged. The fumes from the exhaust of the vehicles made the already sweltering heat even more difficult to bear. In such times, I have learnt to focus my attention on something other than what causes me concern or what remains out of my control. So, I kept chatting with my wife or checking cricket scores on my phone or simply watched my breathing. A couple of times that my mind strayed to complain about the heat, din and mess we found ourselves in, I brought it back to attend on my breathing. Not everyone around was so forgiving. People were complaining, honking or were trying to elbow other vehicles in the hope that some vehicle ahead would make way and we could move. The next morning’s papers had this moving story on how Chennai halted traffic that evening to save a Life! 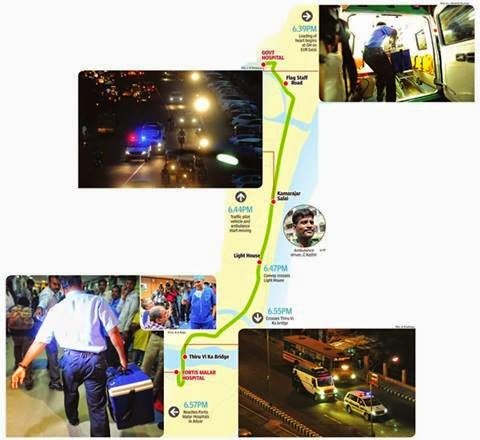 In a beautiful example of precision and coordination between surgeons of two hospitals and the city traffic police, a medical team transported a heart from the Government General Hospital near Chennai Central to Fortis Malar Hospitals in Adayar, about 12 kms away, in less than 14 minutes by creating a “green corridor” – that is, red-light free access. For those unfamiliar with Chennai, it’s important to know that the road connecting the two hospitals is a key arterial road, usually carrying heavy traffic. That the police, doctors and the people of Chennai (unwittingly) cooperated to free up that arterial road, which lead the other roads feeding it getting choked and me and my wife getting into the traffic jam we were caught in, for saving a Life is obviously a great feat. When I reflected on the background to that insane traffic jam we were stuck in, I realized how insignificant our 30-minute wait really was. And I sure all those who honked and complained, fretted and fumed, may have felt that way too. This reflection led to a reiteration of a learning I have had. There will be times when people, events, situations, will be beyond your control. 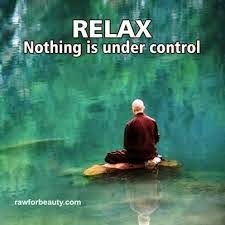 Trying to control that which is uncontrollable is a sure prescription for anxiety and stress. What can you do if you are stuck in a traffic jam and nothing’s moving – actually, when nothing’s movable? What can you do if you miss a flight? What can you do if you have lost your home keys and are locked out for the night? What can you do when you can’t do something about a thing, person, event or situation? Instead of boiling over, focus on your breathing. Use the event or situation as an opportunity to practise patience. When you are patient with someone or a situation, you are peaceful. When you are at peace, you are happy. It is as simple as that! Try practising patience in a stress-filled, pressure-cooker situation the next time you encounter one. Believe me, you will feel lighter and more cheerful! 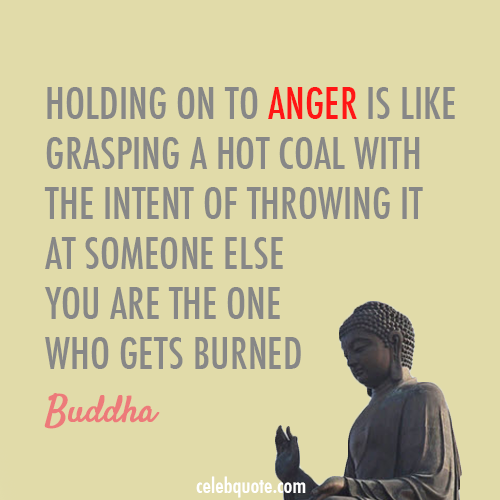 Anger is an expression of energy being wasted in you. When you are angry at someone or something, some part of you, within you, burns first before that energy is expressed on a target. You can’t avoid anger altogether – but the key is to be aware whenever you get angry! Understanding, and being aware of, anger is important to live intelligently. Anger and desire have a connection. You want something or you want someone to do something or even when you “want” someone to love you or respect you, and you don’t succeed, you immediately get angry. Your deep, intense feeling of depravation is expressed as energy that gets beamed on whatever or whoever came between you and what you desired. That’s why you intensely dislike whatever or whoever came in the way. This intensity is nothing but anger. It starts first by burning within you and then soon gets expressed on whoever or whatever came in your way. This happens only when you want something or someone very badly. When you are awfully serious about Life. But what if you were less serious, in fact a little playful, like in a game? What if you told yourself that you will try your best and that sometimes in Life, you win some, you lose some, what if you were accepting of the vagaries of Life? Will you feel so much intensity within yourself? Will you be so rabid about not getting what you wanted? Of course not. This is the balance, this is the tolerance that comes from understanding Life, from being accepting, by being playful. This is what being aware really means. Awareness cannot stop you from getting angry. But it serves as an early warning or an alarm system that goes off as soon as anger rises in you. A question that may come up is how can you achieve anything in Life without being serious about it? Indeed, focus and being serious are critical to any ambition being fulfilled, to any dream coming true. So the suggestion here is not to dissuade you from being either focused or serious. What I am saying is that you can’t always get what you want in Life. When you don’t get it, when you fail in your efforts, don’t let your failure consume you. Don’t be so serious with yourself and Life that your frustration and anger destroys you. Temper your ambitions with a deep understanding of Life. When you don’t get what you want, you would normally expend energy by being angry with yourself or with whoever prevented you from getting what you wanted or with Life. If you invest that energy instead on learning from your failure, you will get better at whatever you are trying to do. That’s what awareness can help you do – become a better player. When you play better the next time, the chances of your winning, of getting what you want are that much higher! Remember: you can neither repress desire. Nor can you control anger. You can only learn to be aware of both. When you live with awareness though, a certain peaceful quality, a tolerance arises in you. Your awareness alone is capable of drowning every wave of anger that rises in you every time your wants are not met. Interestingly, it is this same awareness that can guide you to getting whatever you want from Life! Don’t try to control your Life – you simply can’t! Wanting to control Life is like trying to hold on to water in your fist. However hard you try, the water will always slip away…leaving your hand wet, but empty! I explained to him that there never is a thing called a mid-Life crisis. “You feel crisis-ridden because there’s a turmoil within you. Your wants are in conflict with your reality,” I said. My friend wants a more challenging and well-paying job. He wants to save money for his kids’ higher education. And the reality is that he is having a mediocre job, that pays him just so much that he can make ends meet. Which means the reality is that he is unable to save any money. His insecurity, his gripped-by-crisis-like feeling comes from his wants. His reality is perfect as it is. His wants are what are disturbing him. I said that the only way he could change his reality was to work on it instead of worrying about it. This is so true for each of us in our own Life situations. Our upbringing and education make us believe that we are in control of our lives. To a large extent it just appears to be so. You study hard, you graduate, you get an employment, you start earning and saving. When this pattern of progression is uninterrupted, it soon becomes predictable and also makes you believe that you have caused and controlled your Life and career. But ask those who have seen a series of interruptions early on in their lives and they will tell you a different story. Someone’s been dyslexic or someone’s been orphaned or someone’s had an accident leading to a disruption in academics or someone’s just not found a job despite good grades! Ask these folks and they will tell you that nothing is really in our control – that we are merely being led by Life. So, there’s really no crisis and definitely no such thing as early-Life or mid-Life or late-Life crisis. There’s just Life happening in its own unique way for you – all the while. Whatever’s happening is your current reality. Period. As long as you are focused on that reality and acting from that point of view, you will be fine. The moment desire steps in, the moment you start wanting the reality to be different or starting thinking of a future reality, misery will set it. You could feel anything – from anxiety to suffering – and all of them will be debilitating. This does not mean inaction at all. I am not advising my friend to live with his mediocre, low-paying job forever. All I am telling him is this – please look for a better opportunity, but don’t pine for it. Keep trying, but stop lamenting. Keep the focus on what you must do, just don’t concentrate on what you don’t have. Accept the Life that you have rather than trying to control it. Life has been going on, is going on and will go on not because of you but in spite of you! This is the truth. When you awaken to and understand this reality, you too will learn to be peaceful and to go with the flow of Life! Author AVIS ViswanathanPosted on March 16, 2014 March 14, 2016 Categories Anxiety, Art of Living, Career, Control, Happiness, http://schemas.google.com/blogger/2008/kind#post, Inner Peace, Insecurity, Intelligent Living, Life, SufferingLeave a comment on Don’t try to control your Life – you simply can’t!